Remember how you felt when you first heard the story of Charlie? 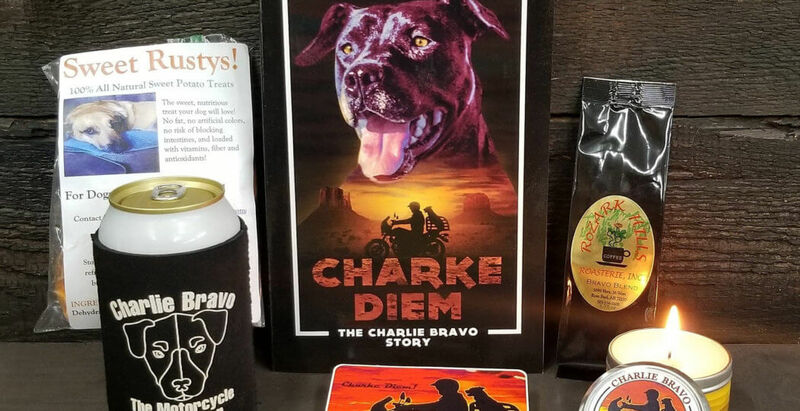 Now you can share this story with family and friends with a Charlie Bravo Gift Box, shipped directly from the Casa del Whackos just in time for Christmas. A first edition of the book, pawtogaphed by the queen herself. A sagebrush scented candle, created especially for Charlie by the Cimarron Candle Company in, you guessed it, Cimarron, New Mexico. Nothing takes you west like the scent of high mountain sage; unless its the motorcycle, but we couldn’t fit the Honda into the box. A bag of Charlie’s robust “Bravo Blend” coffee, guaranteed to get your motor running. And who knows what other items might just find their way into the box? All this for only $49.95, and till the first of the year, use discount code 2018FreeShip to get free shipping to any location in the continental United States. Place your order soon, as we have a limited supply, and Merry Charkmas from the Casa del Whackos! Can we have Charlies items sent to Canada?